The 2018 World Breastfeeding Week theme was tagged: Breastfeeding-foundation of life. A Ministerial Press briefing and high policy dialogue was held on August 2nd 2018 in Abuja to flag off this year’s commemoration. It considered efforts at promoting Exclusive Breastfeeding and securing increased commitments towards its sustenance in Nigeria. The event overview was presented by the Executive Secretary of CS-SUNN, Beatrice Eluaka. She gave the highlight of the program stating clearly the slogan as ‘Breastfeeding the foundation of Life’. According to the ES, the High Policy Dialogue is aimed at elevating the issue of breastfeeding in national discourse, increasing the the level of understanding and knowledge among policy makers to motivate them on exclusive breastfeeding and promoting salience of exclusive breastfeeding. The Hon. 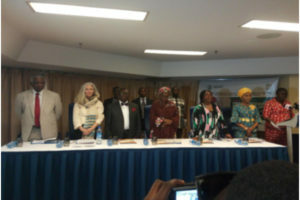 Minister of Health, Prof. Isaac Adewole in his keynote address announced that Nigeria will launch a “zero stunting” campaign in order to reduce the high numbers of stunting and wasting within the country. He also revealed that he was having talks with the Ministry of Labor and Employment to extend maternity leave from four to six months. Highlights of the event include presentations and a Panel Discussion tagged “Progress on Promoting Breastfeeding for Sustainable Development in Nigeria” moderated by Dr. David Olayemi, the Steering Committee Chairman of CS-SUNN. 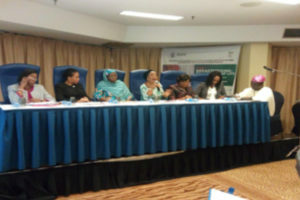 It had as panelists, the President of the Nigerian Association of Women Journalists (Mrs. Ifeyinwa Omowole), a representative from NAFDAC, President NECA (Network of Entrepreneurial Women), a Representative from Gender and Governance, a spokesperson for Ministry of Labor and Productivity and the Nigeria Governor’s Forum. The discussions brought to the fore, efforts around promoting breastfeeding and put forward suggestions to better promote EBF in Nigeria.